Isn’t it interesting that as soon as it was clear Tiger was out of the running at the Masters the announcers began to elevate Phil while downing Tiger? Congrats to Bubba Watson for winning the green jacket on the 2nd playoff hole. We bet you never associated the name Bubba with golf. Of course the redneck jokes have already started about what he’ll select for the Masters champion dinner. 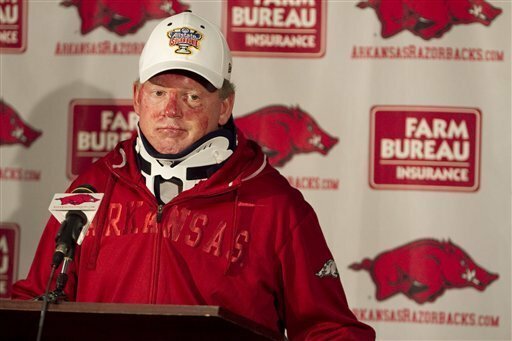 Bobby Petrino was in a motorcycle accident while giving a ride to his 25 year old mistress, who’d just been hired in the Arkansas athletic department the week prior. We’re sure Atlanta Falcons fans are calling this entire incident karma. With the way they’ve played lately is it possible John Calipari, head coach at Kentucky, could finally win the NCAA tournament with a team of his fabulous freshmen? Duke’s late game heroics are thrilling but how far will playing like that get them in the NCAA tourney? Tebow reigns! This time when it matters most. But let’s not forget Demaryius Thomas with that mean stiff arm. The Saints scored all over the Lions. There was no mention of Suh and the defense throughout the game. That could be a good thing as he needs to work on his rep as a dirty player. The Lions definitely weren’t ready for prime time on Saturday night but with that young nucleus they could be dangerous for the next decade. The screwed up NCAA football postseason can be summed up by the #7 team in the country playing the 6-6 Arizona State Sun Devils in a bowl game on December 22nd. Kellen Moore finished his college career with a 50-3 record and if he went to a school other than Boise State he may have won a Heisman. USC QB Matt Barkley decided to stay in school and return for his senior season with Lane Kiffin. But…Kiffin over the NFL? Huh? As if Penn State hasn’t had enough problems their QB, Matt McGloin, suffered a seizure and was hospitalized due to a locker room fight with Curtis Drake, WR. What’s really good? Quietly the NCAA has decided to hold off on plans to pay student athletes an additional $2,000 stipend. Let’s hope they can agree to enact this, it’s the least they can do. How rude of LSU, letting both Arkansas and Georgia think they had a chance of winning before coming back and smacking them silly. Tyrann Mathieu surely lived up to his “honeybadger” nickname with two punt returns in the SEC title game. Oh Stevie, we know you like to celebrate with the best of them but do ya think it came back to bite you in the final minutes with those dropped passes? Was the Houston Texans stadium built on an ancient burial ground? How else can you explain them losing their first and second string quarterbacks in the year it looked like they’d run away with the division? Ndamukong Suh deserves his two game suspension. Not as much for this act as for the horrible attempt at an explanation and that wack apology.